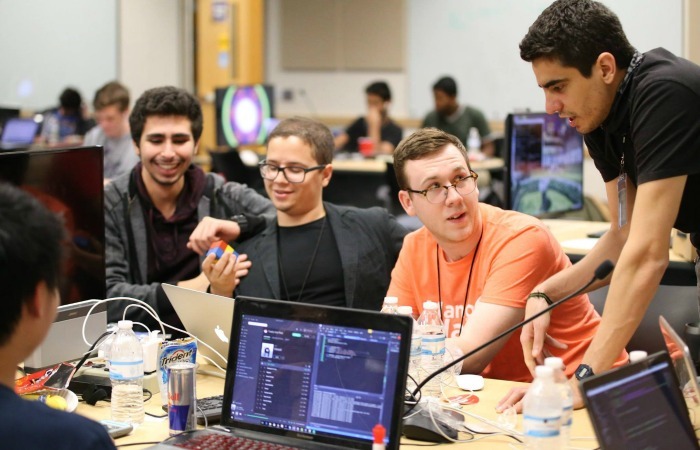 MangoHacks mentor Jacob Jenkins (center, orange shirt) brainstorms with attendees Baruch Hen (left) and FIU students Jose Morgan (center, dark jacket) and Lukas Borges (right, standing). Photo by Kelly Mahoney. Sleeping bags and pillows were strewn around classrooms in PG 6 Tech Station while a few students took a quick nap or ate breakfast as the final day of MangoHacks began. Many were tired, but they were the proud survivors of 36 hours of coding and building. The students had accomplished their goal: to create a project in one weekend, during one hackathon. 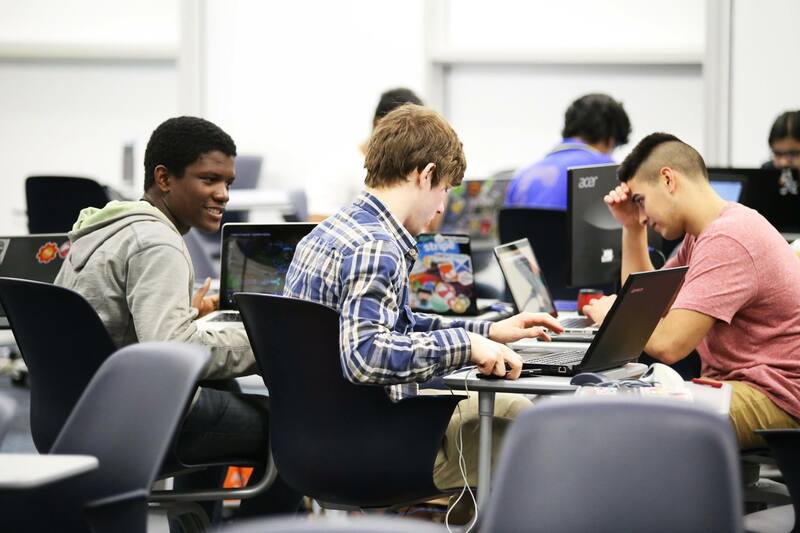 FIU students Kerlin Michel, Mark Fajet and Lester Ramos collaborate on their app. Photo by Kelly Mahoney. Their group won second place with Belated, a plugin to manage and prioritize messages for people catching up with conversations on Slack, a chatroom-like program. The group plans to continue working on their plug-in and possibly expand it to work for more applications in addition to Slack. Another team created the Gethr app with which users can post events and see what people on their Twitter or Facebook groups are posting, and what events are happening. “It’s connecting similar people with similar events,” FIU business major Edison Espinosa explained. The team plans to continue work on their app and they hope to become one of the first completely student-run startups in Miami. FIU student Jaime Acevedo and Adrian Rodriguez also saw the potential to help the community through the event. “We decided to build something that could solve a problem,” Rodriguez, computer science major at Miami-Dade College, explained. Their project: building WalkR, a low-cost, smart prosthetic leg that can adjust its size automatically according to the angle the prosthetic leg is bent. 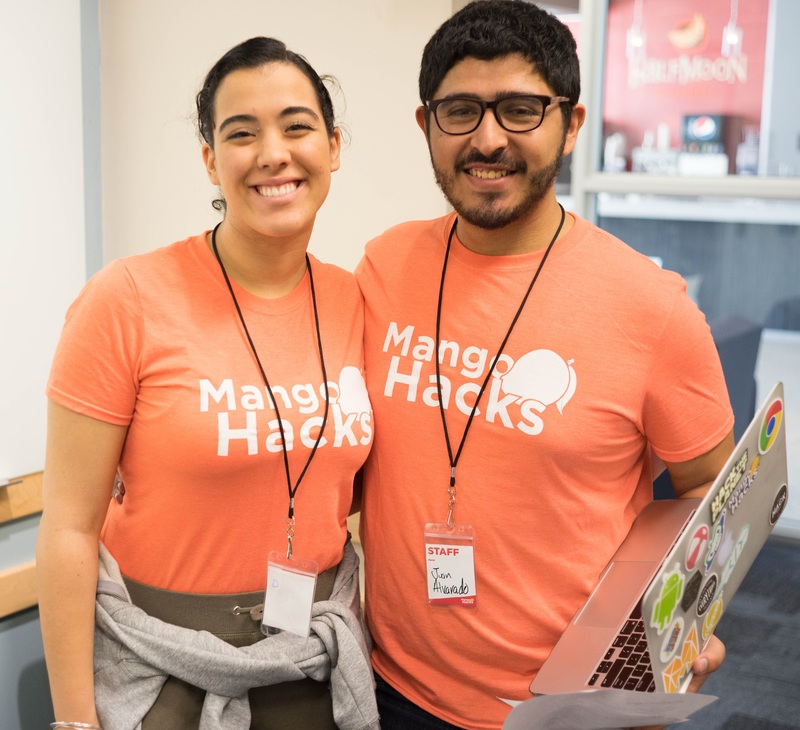 MangoHacks attendees celebrate finishing their projects. First place: Caeley Looney from Embry-Riddle Aeronautical University and Gene Chorba from Georgia State University with their Emote app, designed to identify the emotion on someone’s face in an image. I would rather know more about the 1st place team then the others, you barely mentioned them. As FIU’s official news site, we chose to highlight the work of our students. All winners are mentioned. Thank you for reading FIU News. Great article about the event, but can you tell us more about the winning team? You seem to have only covered the FIU students. Was there some sort of scandal around the first place team? It was barely covered in the article.